Where Did I Get It? I received a copy as part of the Parragon Book Buddies Scheme in return for an honest review. Blurb: When small-for-his-age Noah Shrimpton moves to a new school, the class bully starts picking on him. Noah has no friends to support him and is afraid to tell anyone. He starts to use his journal to express himself, doodling all sorts of outlandish scenarios where he beats the bully (sometimes involving superheroes or giants!). Follow Noah as he learns to make friends and gain the confidence to stand up to the bully in this contemporary tale. This is Noah Shrimpton. He lives with his mum and his dad and his dog Dixie. 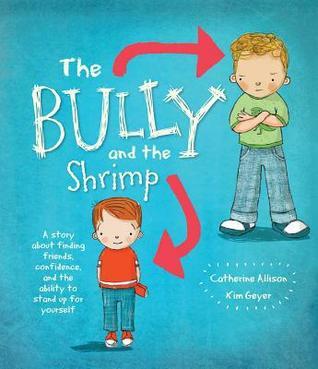 My Review: The Bully and The Shrimp is a great book for children about to start school as well as those already attending. It sensitively and entertainingly broaches the ever-constant issue of bullying in a way that is accessible to young children and covers all the emotions felt by both the person being bullied and the bully themselves. Cleverly illustrated half as Noah Shrimpton’s diary showing his emotions with doodles as well as words, The Bully and The Shrimp gives you plenty to talk about with your child as you share it together. The story is written from the perspective of the child being bullied but we found it was very useful and effective to read with Tori on a day when she had been very overbearing with Arthur and their friends. It helped her see how sometimes she can slip from a bit bossy into the edge of bullying territory and it showed her how she might be making the other people feel. It is very hard to explain to a five year old how their ‘playing’ might upset other people but The Bully and The Shrimp did it brilliantly. At one point, Connor grabs and takes Noah’s pencil crayons – something Tori had done to Arthur that day – and when she read how that made Noah feel upset and cross she said ‘Is that why Arthur didn’t want to play with me anymore?’ It was a gentle prod towards helping her see how her own actions can affect other people. I can see it being a brilliant resource for all parents of children at school – it is fun to share and shares an important message without being accusatory or judging anyone. There are extra resources at the back for the grown ups to help if your child is being bullied which is a nice touch and helps lift it from ‘just a picture book’ to a real helpful tool. A great book even if there are no bullying issues around anyone reading, The Bully and The Shrimp is a great example of the power books can have to help people. A great addition to our shelves that I am sure will be called upon again and again as Tori and Arthur go through school.